After exploring the nooks and crannies of Bentota, head over to the Spa at Saman Villas to pamper yourself with treatments based on age old traditions of natural healing using essential oils and herbs. Holistic therapies such as Aromatherapy, Ayurveda, Reflexology and Hot Stone therapy are used to give you an unforgettable spa experience. How popular is Spa At Saman Villas? People normally club together Bentota Ayurveda Centre and Lunuganga while planning their visit to Spa At Saman Villas. Wonderful experience. Last three days of our amazing trip to Sri Lanka. People at Saman Villa are really helpful in any way. The food is very nice. The endless fruit dishes. Especially of course the local dishes. The rooms are large and have all the facilities needed. Bathroom and shower is partly outside which is really nice. Swimming is a luxury, huge infinity pool overlooking the sea and the beaches. Tip: have dinner on the rocks, dinner next to the sea! A beautiful hotel, located on a slope. Very nice and helpful service. Wedding ceremony from the beginning to the end at the highest level. I would highly recommend. And thank you very much Dinushi. We'll be back! Disappointing and Wasting of money.. I can’t believe its a 5 star hotel..!! Its away from luxury, pictures are cheating and villa’s decor is below average. The electricity was disconnected 2-3 times everyday. Spa service was so so and not worth the price. Only food and staff were great. The access to the beach is tight and risky with too many rocky steps. And no beach beds at all..!! 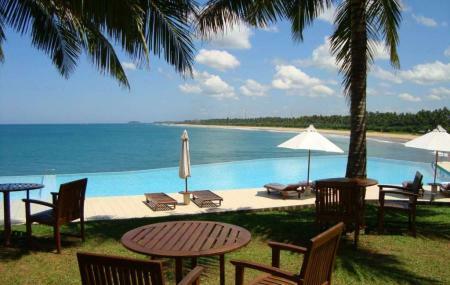 Overall, this resort will cost you triple price of much better resorts in srilanka. Stunning view of the ocean . We stayed in our deluxe suite with pool we enjoyed every moment for 4nights . The staffs are great n friendly . Beautiful resort and good relaxation but too quiet in the resort restaurant . We prefer light music to enhance the surrounding. However Bad internet connection in the deluxe suite room23 Still worth the stay.